As we all know in blogger, above header there is navbar or navigation bar . 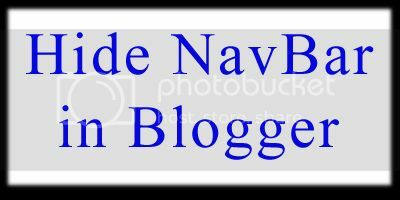 Most of want to hide the navigation bar in blogger , but we don’t know how to do that. Never wonder here is a simple trick to hide the navigation bar in blogger . Log in to your blogger account and select the Layout of the blog which you want to modify. now paste the CSS code above the line in red. That’s all. From now onwards your blog will not display navigation bar.